It is common that the highest possible precision is an essential requirement for any successful space mission. An impressive example of the planning to perfection of an image of an extraordinary object in the solar system has now been provided by the German Aerospace Center (Deutsches Zentrum für Luft- und Raumfahrt; DLR) in collaboration with the Space Operations Centre of the European Space Agency (ESA) in Darmstadt. For the very first time, the two tiny Martian moons, Phobos and Deimos, have been photographed together at the highest possible resolution. This was done with the Super Resolution Channel (SRC) of the HRSC (High Resolution Stereo Camera) experiment on ESA's Mars Express Space Probe, a project directed by DLR's Institute of Planetary Research in Berlin-Adlershof together with a scientific team from the Free University of Berlin. "It doesn't happen very often that both Martian moons are right in front of the camera, directly one behind the other," says the DLR institute's Harald Hoffmann. "During the now more than six-year long project, we have had several opportunities to photograph the two moons together," explains Klaus-Dieter Matz, who planned the extraordinary images with the Mars Express camera system together with Harald Hoffmann. "But the geometrical relationship of this configuration during Orbit 7492 on 5 November 2009 was especially favourable, so this time we decided to try taking a sequence of photographs - and this first attempt gave us exactly the results we were hoping for!" On one hand, the images underline that it is well possible with existing orbital parameters of the space probe and the two Martian moons to aim at the targeted objects with highest precision. On the other hand the image data serve in the long-time task of the HRSC Science Team to validate and refine existing orbit models of the two moons. 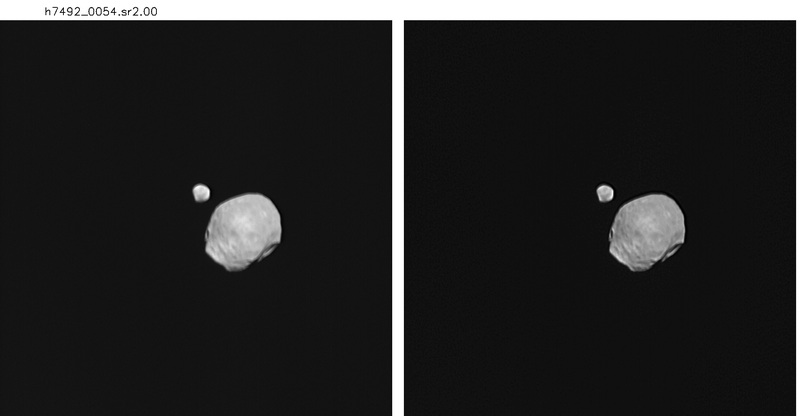 For the first time, both Martian moons, Phobos and Deimos, have been captured together in a sequence of high-resolution images. This was made possible by the fact that the two moons were both in the field of view of the High Resolution Stereo Camera (HRSC) camera system onboard the ESA Mars Express probe on 5 November 2009, one behind the other. The HRSC made 130 individual exposures with its SRC (Super Resolution Channel), 120 of which have been edited into the animated sequence shown here. The exposures were made first at intervals of one second, and speeded up to half-second intervals in the middle of the sequence. For technical reasons - Mars Express is in a polar orbit and travelling from north to south, while the moons are moving perpendicular to it in equatorial orbits - north is to the right of the images in the sequence. At the time of the exposures, during mission orbit 7492, Phobos, the larger of the two moons and the one whose orbit is closer to planet, was 11,800 kilometres away from the Mars Express, while Deimos was 26,200 kilometres away. Due to these large distances, the Super Resolution Channel of the HRSC was used, a channel which uses an additional lens which, with its field of view of just 0.5�, provides four times the magnification of the HRSC itself. The resolution of the images is around 110 metres per pixel for Phobos and 240 metres per pixel for Deimos, which was twice as far from the camera. Animation: ESA/DLR/FU Berlin (G. Neukum). At the time of the exposures, Phobos, the larger of the two moons and the one whose orbit is closest to planet, was 11,800 kilometres away from Mars Express. Phobos orbits the planet in just 7 hours and 39 minutes, and is thus travelling much faster relative to Mars than the Moon travels relative to Earth, which means that the exact timing of the exposure was absolutely critical. At the time of the exposures, Deimos was 26,200 kilometres away from the probe. Due to its distance from the camera, the Super Resolution Channel of HRSC was used, a channel which uses an additional lens which, with its angle of view of just 0.5°, provides four times the magnification of the HRSC itself. Due to the telescope mirror's triple-focus distortion error in the Super Resolution Channel, the images had to be processed. This was done by the working group of the Principal Investigator of the HRSC experiment, Prof. Gerhard Neukum, at the Free University of Berlin (FUB). "It is now possible to almost completely eliminate the unsharpness of the SRC images," says Dr Gregory Michael, also from FUB. "The distance between the space probe, Phobos and Deimos was relatively large, so that the resolution of the SRC images was around 110 metres per pixel for Phobos and 240 metres per pixel for Deimos, which was twice as far from the camera." 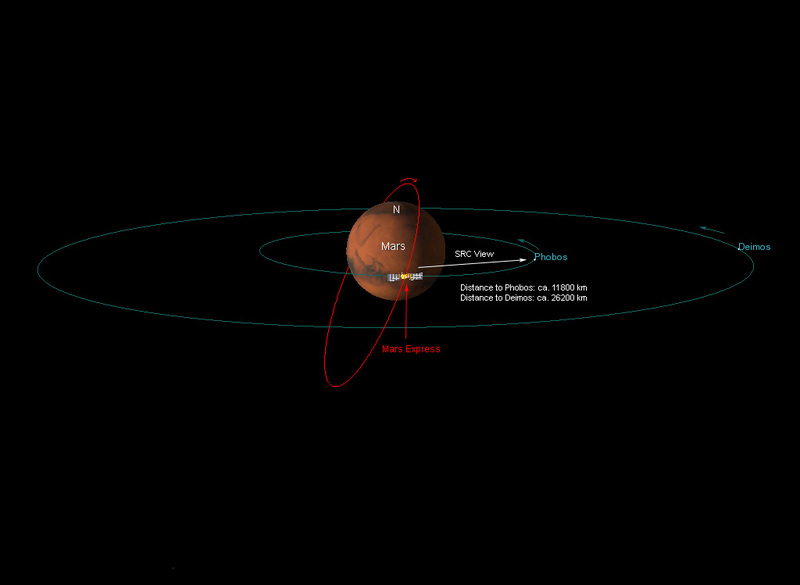 The orbital trajectory of Mars Express, in contrast to that of the two NASA orbiters, Mars Odyssey and Mars Reconnaissance Orbiter, means that only the ESA probe ever sees both moons at the same time. Mars Express's elliptical orbit puts it at around 10,000 kilometres away from the planet's surface, which gets it as close as 9,000 kilometres away from Deimos in ideal conditions. The best image so far taken of Deimos by Mars Express was made at a distance of 10,000 kilometres, and the best images so far of Phobos were made in 2008 at a distance of just 93 kilometres. Both moons orbit Mars in almost circular and close to perfectly equatorial orbits. The ESA probe Mars Express has been orbiting Mars in an elliptical polar orbit since 25 December 2003 - at an angle of almost 87� to the equatorial plane - which brings the orbiter to an altitude of just 240 kilometres above the planet's surface three times a day (red orbit). The furthest distance of the orbiter from Mars during the orbit is around 10,000 kilometres. Phobos, a potato-shaped body with dimensions of 26.8 km � 22.4 km � 18.4 km, orbits the planet in an almost circular equatorial orbit at a distance of 6,000 kilometres. 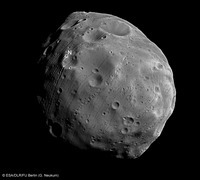 Deimos, which, with its dimensions of 15.0 km � 12.2 km � 10.4 km is the smaller of the two moons, orbits Mars at a distance of around 20,000 kilometres. During the almost six-year long Mars Express mission, the geometrical configuration of the two moons relative to the probe on 5 November 2009 presented a unique opportunity to capture the moons in a sequence of images. Phobos and Deimos were directly in the field of view of the orbiter's HRSC (High Resolution Stereo Camera). In a critical period of one and a half minutes, the SRC took 130 images at intervals of one second, speeding up to half-second intervals towards the end. "As soon as the pictures were sent from the ESA Control Centre in Darmstadt to our team in Berlin, we recognised that our camera targeting and ESA's orbital calculations were in perfect agreement," says HRSC planner Hoffmann. "We were pretty sure that the shoot would be successful, because our colleagues at ESA had seen no reason to make corrections to our calculations on the basis of Mars Express' trajectory." ESA's European Space Operations Centre (ESOC) in Darmstadt has controlled the Mars Express probe since its launch on 2 June 2003; the mission has just recently been extended to the end of 2012. The success of the experiment depended critically on highly precise ephemerides, tables that give the positions of the planets, moons and smaller bodies in the solar system, as well as those of space probes. The ephemerides for Phobos and Deimos have been corrected and refined over the six-year duration of the Mars Express mission, and the orbit of the probe itself can be predicted extremely precisely by ESOC, so that its position during the shoot diverged by only a few seconds or kilometres from the position that had been predicted several months previously during planning. "The orbit diverged by around 10 seconds from the expected values, this is a very small divergence and is well within the tolerance of even as small a field of view as 0.5°," says Klaus-Dieter Matz. On 5 November 2009 it was, for the first time, possible to acquire images of Phobos and Deimos together in high resolution. A highly precise plan enabled the High Resolution Stereo Camera (HRSC) Experiment Team for Mars Express at the DLR Institute of Planetary Research, in collaboration with the Principal Investigator's team at the Free University of Berlin, to take a total of 130 images of this unusual configuration. At the time of the exposures, Phobos, the larger of the two moons (to the right in the images), was 11,800 kilometres away from the Mars Express, while Deimos was 26,200 kilometres away from the camera. Due to these large distances, the Super Resolution Channel of the HRSC was used, a channel that uses an additional lens which, with its field of view of just 0.5�, provides four times the magnification of the HRSC itself. However, the raw images have a small triple-focus error due to the distortion of HRSC's mirror. The SRC images therefore had to be processed (left-hand image), thus eliminating the unsharpness in the images almost completely (right-hand image). The resolution of the SRC images was around 110 metres per pixel for Phobos and 240 metres per pixel for Deimos, which was twice as far from the camera. Images: ESA/DLR/FU Berlin (G. Neukum). Along with the high-resolution global mapping of the surface of Mars with the HRSC, in colour and 3D, the exploration of Phobos is another scientific priority of the camera experiment. The potato-shaped, 27 km � 22 km� 18 km moon has already been photographed 127 times by the HRSC camera system, which has not only significantly improved our topographic knowledge of the satellite, but has also given us important insights into the origins and development of Phobos. The HRSC camera experiment on ESA's Mars Express mission is directed by the Principal Investigator (PI), Prof. Dr Gerhard Neukum (Free University of Berlin; FUB), who also designed the high-resolution stereo camera. The team is composed of 45 Co-Investigators from 32 institutes in 10 different countries. The camera was developed at DLR under the direction of Prof. Neukum and built in collaboration with industrial partners EADS Astrium, Lewicki Microelectronic GmbH and Jena-Optronik GmbH. The experiment on Mars Express is operated by the DLR Institute of Planetary Research (IPR), through ESA/ESOC. The systematic processing of the HRSC image data is carried out at DLR. The scenes shown here were processed by the PI-group at the Institute for Geosciences of the Freie Universitaet Berlin in cooperation with the IPR, Berlin. Along with the geological characterisation and high-resolution global mapping of the surface of Mars with HRSC, in colour and 3D, the exploration of Phobos is another scientific priority for the Mars Express HRSC experiment. During the six years of the mission, the larger of the two moons has already been photographed 127 times by the HRSC camera system and its integrated Super Resolution Channel (SRC), which gives images with four times the magnification of the standard system. Mars Express has come as close as 93 kilometres to the 26.8 km � 22.4 km � 18.4 km moon. Phobos circles the planet in an almost completely circular equatorial orbit at a distance of 6,000 kilometres. The image shows the northern hemisphere of Phobos, pocked with innumerable meteor craters (N = North Pole). The exposure was made on 28 July 2008, during Orbit 5870, with the nadir channel of the HRSC, which is perpendicular to the surface. Mars Express was 351 kilometres away from Phobos at the time of the exposure and the resolution is 14 metres per pixel. * The orbital period for both moons almost precisely equals the length of day since both Phobos and Deimos orbit Mars in what is called a �coupled rotation', so that one hemisphere of both moons permanently faces Mars.